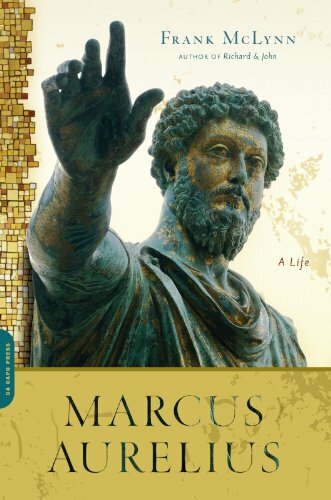 Time to start reporting my thoughts about the recent biography of Marcus Aurelius, by Frank McLynn (Da Capo Press, 2009). I am about halfway through it, and will comment on a number of aspects of it, but I can already tell you that it is a missed opportunity. McLynn both hates (with gusto!) and does not understand Stoicism. And it is next to impossible to do justice to Marcus from that point of view. I’m not suggesting that a biographer of an emperor-philosopher ought to buy into his subject’s philosophy. Far from it. Indeed, one does not even need to be particularly sympathetic to his subject in order to write a good biography. But one does have to make an effort to be charitable, which McLynn simply refuses to do, as far as I can see. This post will focus on the Introduction to the book, which sets the tone for what’s to come. I hope to then come back and comment on selected chapters, and certainly on the first Appendix, entirely devoted to Stoicism. For McLynn, Pragmatism is a philosophy based on the idea that truth can be judged by its consequences (a decent approximation, though with major differences between James and Dewey). But if so, then it is hard to see the proximity with Stoicism, which of course is a virtue ethical philosophy. McLynn ventures even further: “pragmatism in the U.S.A. functions as an ideological ‘support’ for the social and political system, just as Stoicism did in Roman society. Stoicism was a primitive form of pragmatism.” Uhm, no, it wasn’t, and to claim so is either to misunderstand Stoicism or Pragmatism, and possibly both. The disanalogy should be even more obvious once we consider that there was a large number of fiercely competing philosophies during the time of the Roman Empire, some more popular with the aristocracy, others with the military, yet others with different social strata. That’s a very different situation from contemporary USA, where most people wouldn’t be able to mention even the just the name of any philosophy at all. Yet another reason for modern appreciation of Marcus, the biographer proposes, is the Emperor’s feelings for nature, which are compared to “Wordsworth’s position in the Prelude and the ode Intimations of Immortality — a deep appreciation of sensuousness tinged with melancholy.” This too seems to be off the mark. When Marcus writes about the beauty of baked bread and ripe figs he is praising the Logos as the rational principle permeating the universe, and anyone who has read the Meditations will be hard pressed to picture Marcus as a Romantic. Nonetheless, “despite his huge influence, Marcus is a hard act to follow. His actual lesson was that one has a duty to involve oneself in everyday life while seeing it for what it is and holding it at bay with mental reservations; this is not the same thing at all as reclusive withdrawal or the life of the artificial solitary.” There I agree: Marcus is a tough role model, but isn’t that precisely what we want from role models, that they set the bar high for the rest of us? This entry was posted in History & Biographies, Marcus on March 1, 2016 by Massimo. Great review for the first chapters of the book . it seems, that this book would not give us the opportunity to understand the life of this great man. Would you recommend to us what you think is a great biography of Marcus Aurelius. This sort of prejudiced attitude is all too common, unfortunately, and seems to indicate to me a lack of an open mind and a fixation to certain attitudes. The author probably had an axe to grind before writing even a single word, and then proceeded to search for every piece of evidence to back it up, fabricated if necessary. This is decidedly th opposite of rational inquiry in which you hear the facts first and then make a judgement. Unfortunately, the Stoics are proven too correct in their claim that people tend to argue by emotion instead of reason. I have a colleague that behaved this way when I mentioned to her that I was studying Stoicism. When I brought up Marcus Aurelius, she remarked that she could see no value in Stoicism because he had been responsible for Christian persecutions and “what sort of philosophy is it that allows widespread persecution?” I had never even heard of him involved in Christian persecutions and found some small mention of it in Wikipedia. You see that before any information is even gained, the entire subject is dismissed. Does the author explain why he would take the time and energy to write about a subject he doesn’t like? One can understand Hannah Arendt writing about Eichmann but Marcus has a good reputation among historians. Marcus Aurelius’ leadership qualities have been criticized by other historians, but one should not convict an entire philosophy because of it. The points made in Meditations can still reflect honest, valuable and useful features even if the author did not necessarily apply them properly. I do not dismiss the accomplishments of FDR just because he interred Japanese-Americans. Aurelius has been criticized as having poor leadership decisions in some ways, most notably by naming his son Commodus as successor. The fact that you cite him as reflective of the sins of the father suggests to me that you are not entirely using reason in your argument. Also you mention many things without citation, such as a Christian registry. If my memory serves me, this actually happened much later, under the emperor Decius, where citizens in some parts of the empire had to produce a “libellus” to prove that they were of correct religious persuasion. I’m loathe to suspect a lot of these references you mention are made up. Christian persecutions were not systematic at the this time in the empire. Dear Nanocyborgasm: You give a reason I use and tell me I am “not entirely using reason”? Who does? CPUs? Aurelius made Commodus a “Caesar” at age 5. Five, It had NEVER happened before. Never. So much for the greatly virtuous man. I know Roman history well enough to know Aurelius ordered the registry of Christians. I am not getting confused with Decius, 75 years later. My fundamental critique of Aurelius is about his advocacy of “intellectual fascism” as explained above. I don’t practice the religion of the celebrity cult. Not with Einstein, not with Joan of Arc, not with Leonardo di Caprio, etc. Neither do I anti-celebrity cult. I recognize the greatness of Demosthenes, Abelard, Buridan, Giordano Bruno and maybe even Francis of Assisi. Well, Aurelius obviously thought it did, and acted on it throughout his reign. Julius Caesar had decreed that Jews did not have to sacrifice to the Roman Gods, and still could be Roman citizens. Emperor Decius, around 250 CE ordered all citizens to sacrifice to Roman Gods and, or the emperor, in front of a magistrate… Except Jews. It was not specifically oriented against Christians (whereas Aurelius’ registry had been targeting Christians) Christians lived through Decius’ order as a persecution, and many died. When Pliny the younger informed emperor Trajan that he was bothering Christians, and should he register them? Trajan ordered Pliny to cease and desist. So what happened in the meantime, between Trajan and Decius? Aurelius, the pseudo great stoic. I understand this is hard to take for the practitioners of the celebrity cult and pseudo-stoicism. But philosophically it means that there is a danger that stoicism fall into intellectual fascism, and, or, a despicable life, and its terrible consequences, as it did with the unfortunate Aurelius. However, a true stoic enjoys the occasions which are hard to stand. I read McLynn’s biography soon after its publication in 2009. I even went to the trouble of going to one of the bookshops in London (probably Hatchards) which had signed copies. Great anticipation. Huge disappointment. I never expected nor wanted a hagiography but I simply could not understand what led McLynn to attempt such a biography. He had so little sympathy with any of Marcus’ values or beliefs. Massimo detects a lack of effort to be charitable. I couldn’t agree more. Still, it leaves a great subject yet to be given the treatment it deserves. Anyone? Massimo?? good question. I’m not aware of another good biography of Marcus, and would very much welcome readers’ input on this! That was my impression too, except for the fabricated part. The author seems to willfully take the most uncharitable reading imaginable of Stoicism and run with it. I mean, there is serious criticism that can be moved to the philosophy, but this is just a hatchet job. That’s because he didn’t, pace Patrice. Marcus actually protected Christians, to a certain extent. He wasn’t a saint, but definitely not a “fascist,” whatever that would mean in the context of his time. I increasingly find your contributions to be meandering, off topic, and not constructive. Please try to do better, I do have banning power on this blog, as much as I’d really not use it. Yeah, I’m going to continue to stand by my position that the majority of what you claim is fabrication, especially considering the grandstanding tone that you present. Aurelius’ participation in Christian persecution is debated by historians and there is little evidence for it. I’m also going to go all in and suggest that “intellectual fascism” is a fabrication of your making as well. Couldn’t agree more about McLynn’s take on Marcus. Not sympathetic at all to Stoicism, or to MA. MA has often been accused of dyspepsia and melancholy… which is like accusing Sam Beckett of being moody…. but McLynn really does come across as grumpy and sour. Per Candida Moss, in “The Myth of Persecution,” there was no large scale action against Christians before Decius, and any actions that were taken were purely local. As for a “registry” of Christians, I have no idea of what Patrice even means. In all likelihood, the total number of Christians in the Empire circa 180 CE was about 30,000, 0.05 percent of a population of 60 million. To the degree that Xns even distinguished themselves from Jews, such a registry of such small numbers would have been a waste of time. As for naming Commodus his heir rather than adopting somebody? Simple. As any basic history will tell you, Marcus was the first emperor since Vespasian to have a biological son live into adulthood. As for the matter at hand, it’s too bad this bio of Marcus isn’t better, not just on Stoicism, but on his life in general. It is much more than that. Stoicism represents the possibility of an ethical meeting place for all belief and non-belief systems. I think this is a hugely important possibility. There is simply no good reason why you should use a deliberately disrespectful term for Christians. It serves no useful purpose. It hurts large numbers of good people. It poisons discourse and it contributes to that scourge of today’s society, affective partisan polarisation. Moreover it reflects poorly on your character. This is a Stoicism blog which contains an implicit aim – the pursuit of a noble life directed by virtue. It is in that spirit that I call on you to practice tolerance, respect and understanding. Massimo would in reply remind me that a good Stoic would absorb the blows and buffets of misfortune with fortitude. He is right and that reflects the Christian expectation that we too should endure, from the Roman arenas to the modern arenas on the Internet. But that does not stop me from asking for a more civil form of discourse. 1. The Meditations are easily reduced to bite sized aphorisms and thus lend themselves to dispersion, especially over that largest aphorism machine of all, Facebook. 2. It offers guidance free from the baggage of other belief systems and yet is compatible with other belief systems. 3. It is filling the vacuum left by the decline of other belief systems. 4. It reflects the appeal of virtue in a world dominated by cynicism and functionalism. 5. It reflects our admiration for strength and nobility of character in great role models. I used to think they were few Xns at the time of Marcus Aurelius (although I was aware of Saint Justin, Saint Blandine, etc.). Then I found texts (I quoted in comments to another essay several months ago) of extreme vehemence against the Xns, including from Marcus. The situation with Decius was as I described: it was not targeting Christians particularly, but Christians were targeted by Marcus (hey, I target them myself!). The number of 30,000 Xns was probably exceeded in southeast Gallia alone. If you really interested by the subject, please go ahead and read a lot about it. The registry concept started under Trajan, and was explicitly forbidden by him. Labnut: to feel insulted by an innocuous abbreviation seems un-Christian to me (a Xn expert). the number of Christians in Gallia by 450 is, of course, entirely irrelevant to the discussion, since Marcus died in 180. And my (extensive) readings on that period simply do not support any extensive persecution of Christians, especially by Marcus. Labnut, whether accidentally or deliberately, you misread me. Many Christians still identified as Jewish in 180, therefore, they hadn’t “distinguished” themselves from Jews. Patrice, I’ve read extensively in Rodney Stark and other sociologists of religion. Starting with Christian numbers of around 1,000 at CE 50 and a doubling every 30 years (actually lower than Stark’s estimates, which I think are too high) you get to about 30,000 by 180. And, Massimo, this is why I’m fairly open-minded about mythicism in its broadest sense (not the Gnu Atheist sense). Pushing Jesus back to one of the Pharisees crucified by Alexander Jannai allows for an extra century of growth at more reasonable growth rates. Patrice, I also suggest you read Robin Lane Fox’s “Pagans and Christians.” Even in the East, the countryside remained largely pagan for far longer than many think … or than they might like to believe. More accurately, virtue ethics, in different forms provided the underpinning of the elite in Rome. But it was a highly selective form of virtue ethics. The virtue ethics of the elite was what bonded them, giving them identity and sense of purpose. Something very similar happened with the British when their aristocratic class led them to create the British empire. They also were guided and bonded by a highly select form of virtue ethics. That is because a philosophy can be a diffused part of society, forming its zeitgeist. Today’s zeitgeist can be described as a form of pragmatism and moral consequentialism. People practice this while knowing nothing of its philosophical underpinnings. Labnut, well, the topic was about Marcus, and I was, to explicate how virtuous he may have been, or not, pointing out the facts of the matter on the state of Christianity in the empire at the time, as well as the state of biological inheritance in 180. One other tell in Marcus’ favor is that he insisted Verus be named his co-emperor. Hi Socratic, as you well know, certain people(no names, no packdrill) have strong ideological stances and deploy them at every opportunity. In the beginning that is interesting, indeed fascinating, but after a while it becomes more of the same. But the biggest problem is that it excessively dilutes and diverts the conversation. I appreciate that they have strongly held feelings, that they need to express these feelings and they are seeking validation of their feelings. We need some leeway and tolerance but eventually we have to give blunt feedback when tolerance is abused. That is how society works. Massimo does this well but it helps if we support him.